It’s clear to me that there are tons of American Girl Doll fans out there. Naturally, if you have one of these dolls, you are going to want to dress her up and play with her. I recently found the best Etsy shop to purchase handmade clothing just the right size for your dolls! 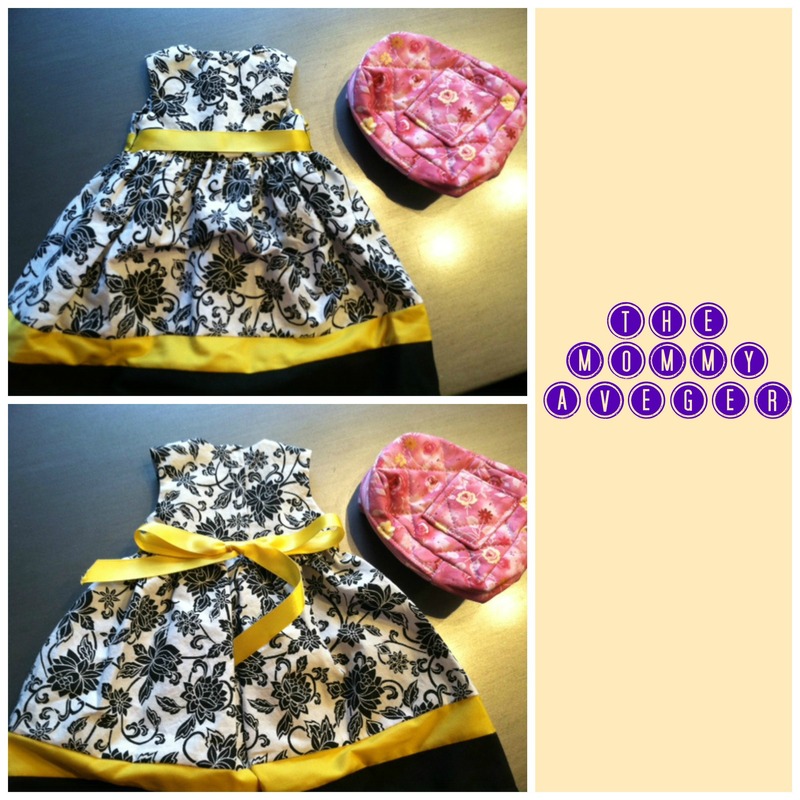 BethsAGBoutique specializes in hand crafted duds that your little girls will go crazy over! So many choices to select from, but check out this gorgeous black and white cotton summer party dress accented with a bright and cheery yellow stripe and sash! It is adorable! It is very well made and is easy to open and close for little hands due to the velcro closure. So pretty! Beth, the owner of the shop, is absolutely wonderful to work with and is extremely talented! You will be so pleased with her products. In addition to clothing, she even makes some fun accessories, like this pink quilted flowered print backpack. Every American Girl doll should have one of these! It even opens and has small pockets for little items you want to keep secure. I am very impressed with Beth’s items and would highly recommend them to you! You can check out her shop for tons of other selections and to order your own. This is part of the #UndertheRainbow Giveaway Hop Event! I am very excited to offer one lucky reader the chance to win this cute dress and backpack! To enter, email me at themommyavenger@hotmail.com with AG clothing in the subject line or leave a comment below telling me why you want to win. Please like The Mommy Avenger on facebook and twitter for an additional entry (but leave a comment telling me you did!). Winner will be selected on or about March 18, 2014 by random via qualified entries and notified by email at that time. Open to US residents only. Welcome to the [2nd annual] Under the Rainbow Giveaway Hop Event, hosted by the Blogging Mamas Network. Who doesn’t love finding gold under the rainbow? I’ve joined with a group of bloggers who will be offering great prizes for you, just waiting to be found under the rainbow! So, hop along to all in the giveaway hop linky below to find your gold! While you’re hopping, don’t forget to enter to win the Grand Prize! Someone will find gold in the form of a $200 Gift Certificate to The Vintage Pearl! I’d like to win so my daughter could dress up her dolls as pretty as her. i want this for my daughter ! :) she would love it ! My niece would LOVE these for her American Girl dolls! It would be an awesome gift for her! My daughter loves her AG and loves to play school. How awesome would it be for her AG to have a backpack when they play school. My youngest just got her first AG doll and it needs new clothes! Would love to win to be able to give her something new. I want to win because I just bought my daughter an American Girl Doll for her birthday present (her bday is April 20th) and this would go PERFECT with it!!! I’d love to win this for my daughter who loves getting new clothes to dress up her doll! I would love to win this for my daughter, I would love to win because this outfit is so adorable!! Love to win this for my niece who loves to dress up her dolls. Would love to win. Our oldest has one of the AG knock-off’s Target brand. Would love some new outfits for her doll. i’d love to win a dress for my four year old daughter! My youngest granddaughter is in love with Kit her American Girl doll , she went to Dallas this month and bought some pets for her doll, she carries that doll all over. She would love to have this beautiful dress. Thank you for including it. I followed you on twitter. I would like to win this for my daughter because she got an American doll for Christmas. Thanks! I would love to win because My little girl always talks about this doll! This would be perfect for my little sister! !